Owned by 10th Mountain, Skinner Hut breaks from common design by having only one story. The Continental Divide is close by, as are plenty of other options for high routes and ski descents. A superb view from the hut's east windows includes the 14,036-foot summit of Mount Sherman in the Mosquito Mountains east of Leadville. Skinner Hut is named in honor of William Wood Skinner, 10th Mountain Division veteran. Funding was donated by Skinner's sister Elizabeth Guenzel, with construction completed in 1990. Because of steep terrain and possible avalanche danger, no route to the Skinner Hut is moderate. Indeed, more than one party has realized that the hut's name comes close to that of an essential piece of equipment for every route to the hut: climbing skins. The Glacier Creek route is the most popular ascent to the Skinner Hut, but involves an extremely steep climb and descent. Busk Creek has easier skiing, but involves more route-finding and distance. Skiing from the Skinner Hut to Betty Bear Hut via Hagerman Pass is relatively benign, but does involve plenty of travel above treeline where wind and whiteouts can foil the best mountaineers. Layout and capacity: 3 small rooms with double beds, additional 10 beds in communal sleeping area. Capacity 16 people. 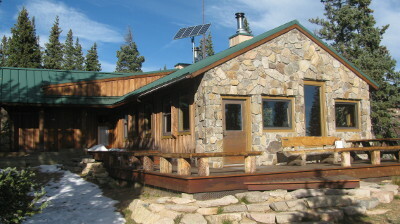 The Skinner Hut is handicap accessible during the summer season, please call for more details. The main winter route into the Skinner Hut follows FS 104 all the way around Turquoise Lake to its west end. From there it follows a marked ski trail up Glacier Creek to the hut. This is the longest ski in to any of our huts and much of the climbing comes in the last 3 miles. Hut users should start early and be prepared for a long day. The Skinner Hut sits just off Hagerman Pass Road (FS 105) and that is the most common access during the summer. There are no established hiking trails connecting this hut. Vehicle access is never guaranteed to any hut at any time. There is not a lot of hiking around the Skinner Hut but there are some old railroad tunnels and remnants of the old Basalt/Midland Railroad south of the hut. For a long day trip you could attempt a high alpine hike all the way to the summit of Mt. Massive.